The Nightmare is literally a horse from hell. But if you want to be more specific, it comes from the Gray Wastes of Hades, the battleground dimension between Hell and the Abyss. These solitary smokey horses hide among the stunted black trees, waiting put to work (willingly or unwillingly) into the evil armies. But they are still difficult to catch. Nightmares breathe blinding smoke and are able to transform their bodies into ethereal substance that travels between dimensions. Their flinty hooves give out sparks when they strike the ground, setting anything flammable alight. Most coveted are the Cauchemars, massive Nightmares fit for giants to ride upon. Went for a more smoke-based nightmare rather than the traditional flaming mane one. Found when reading the description that there were no allusions to flame except for some around the hooves, eyes and nostrils. And they don't deal fire damage, though yes their hooves can set things on fire. Don't ride a Nightmare on wooden floors, kids. Some interesting history behind the concept of the Nightmare. The original Nightmare (the mare of German folklore) was a goblin that sat on the chests of sleepers, paralyzing them and causing bad dreams. The modern scientific explanation for things along these lines are sleep paralysis. Your body becomes paralyzed during sleep, to prevent you from moving around to much as you dream. But sometimes you wake up in a half-asleep state and can't move. And in this half-asleep state you might still be dreaming, and imagine something sitting on your chest. Lots of countries have their own versions of monsters that cause sleep paralysis. I had a similar experience, only in this case my monster was a walrus holding a small shelf asking me to give back the books I borrowed. Dreams, man. The whole horse thing came about as a pun. You know, mare = female horse, nightmares = bad dream, Nightmare = evil horse. Though the first time you can see this pun is in Henry Fuseli's The Nightmare. But similar horses again appear in mythology and folklore. 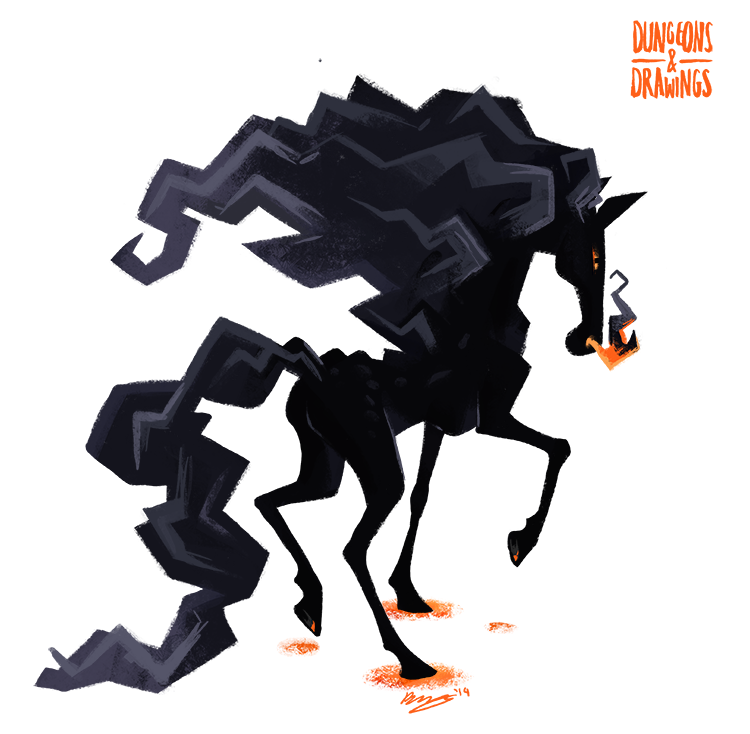 The ones most similar to the D&D Nightmare are prominent in Russian folklore (and probably surrounding countries), where a character (good or evil) rides on a giant ferocious steed with sparking hooves and smoke-filled breath.